The neighbourhood that lies between Bethnal Green, Broadway Market and Victoria Park is an area which has proven hard to put a name to but that’s not stopped it being brimful of places to visit and admire, to shop and to eat and drink. Containerville sits in the heart of this fascinating area, so here we take a stroll past five great local stop-offs, all within a twenty minute walk. We start off with an intergenerational journey, going back in time to a lost world of children’s toys, games and costumes at the V&A Museum of Childhood, who’ve made it their business to collect all things fun since 1872. This red brick building is a portal of discovery, bringing years of playtime to life with photography, exhibits and interactive displays in a building originally constructed in 1872 as the Bethnal Green Museum, including a beautiful arched ceiling, a 360° mezzanine and mosiac flooring. From Victorian praxinoscopes and puppets, to dollhouses and modern day robots, this is a place of wonder for both little and big kids alike. 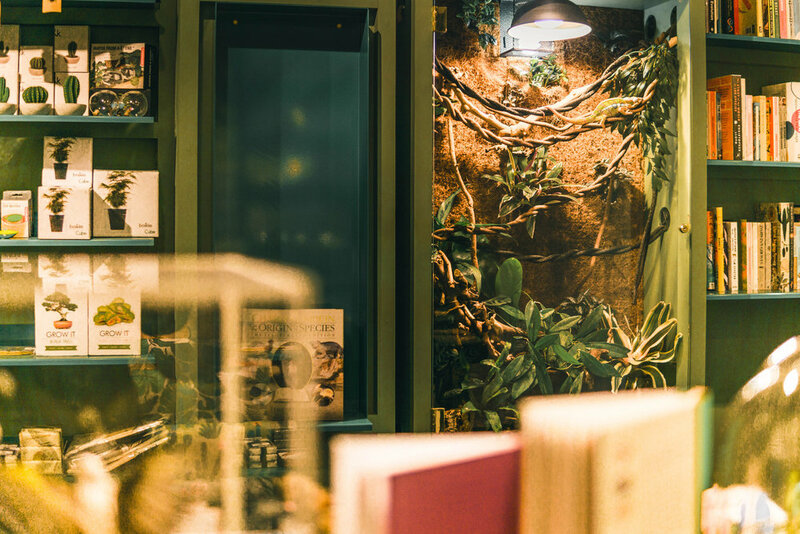 "It's a long story but I got the idea from a shop in Japan and wanted to recreate something as intriguing here, and now this is the only independent natural history gift shop in London. It’s at home in this area." Next up is a modern day curiosity shop - Eastern Biological. You may not have known there was a need for one, but once you step in the Galápagos-inspired store on Hackney Road, we reckon your feelings might change. Drawing from the places and spaces around the world dedicated to Darwinism, the owner, Alf, has taken the concept and run with it. Expect a curated selection of aesthetic gifts, beautiful stationery, books, toys and art prints, along with sea creature ceramics and the occasional pack of fossilised sharks teeth. The pet chameleon, Murloc, is not for sale, but you’re otherwise free to browse around uninterrupted and take your pick. - Aaron McPeake, artist in residence. Guest Projects is an open-plan space by Shonibare Studio that provides a playground for artists to dabble care-free in their chosen discipline. Yinka Shonibare’s own artwork traverses the issues of race and class, questioning societal definitions, so it’s no surprise he sponsors a groundbreaking initiative to democratise the arts. Located just off Broadway Market alongside Regent’s Canal, the space is available for free, and you can apply to have it all to yourself for a full month as an exhibition venue or simply as a testing ground for new ideas. For a desk to dusk treatment, head on to Radio Hair Salon on Broadway Market - we hear they’ll have your bedhead ready for a night out in no time. Part of a chain born in East London, this barber shop is proud of its roots. With high ceilings, wood floors and an all-round minimalist interior, it truly is The East End at its glossiest. Carrying the mantle of hipster super salon, it supports all areas of art from photography and painting to illustration and sculpture - doubling as a gallery space so that you can enjoy the works exhibited on rotation, rather than just an old glam mag. It may seem like the obvious place to end, but it’s the best. Historically a site for grazing animals, today London Fields is home to a wildflower meadow and people lazing in the sun, enjoying 31 acres of greenery in the urban sprawl. If you’ve still got some energy, it’s an exquisite space for outdoor enthusiasts to expend energy and breathe in the fresh air: consisting of a cricket pitch, a tennis court, a bmx track, a couple of pingpong tables, and not to forget - The Lido. Regulars of London’s only heated 50-metre Olympic outdoor swimming pool may have missed their traditional Boxing Day swim due to refurbishments, but they’ll be glad to note it reopened this January. Watch out for part two Local Containerville, all about the food and drink in the local area.